We detail in the game day podcast how many teams might clinch on Saturday. 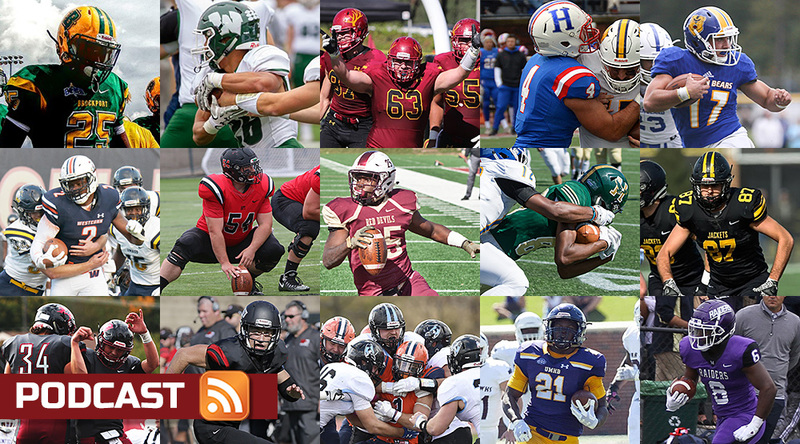 Here our crew will tackle the game of the week, potential upsets, and tell you who might clinch today aside from, say, Mount Union. Our regular crew is Keith McMillan, Ryan Tipps, Pat Coleman, Adam Turer and Frank Rossi. Our sixth spot each week goes to a guest prognosticator, and this week’s is Sean Greene, who does play-by-play for Wesley football games on WDEL radio as well as Wesley’s video stream. Which game is the Week 10 game of the week? Keith’s take: No. 10 North Central at No. 13 Illinois Wesleyan. I’ll go with the Titans for a second straight week instead of E8, NJAC clashes and an NCC win could have a cascade effect. Ryan’s take: No. 10 North Central at No. 13 Illinois Wesleyan. I think IWU should be ranked higher, and I’ve got them pegged to win. Pat’s take: No. 10 North Central at No. 13 Illinois Wesleyan. I’m going to assume most of my colleagues here have good reasons, so read theirs. Adam’s take: No. 10 North Central at No. 13 Illinois Wesleyan. I think the Cardinals are the more talented team, but the Titans have been the more impressive team so far. With a win, IWU can clinch its first outright CCIW title since 2009. Frank’s take: Cortland at No. 3 Brockport. I explain why in the ATN Friday podcast. Sean’s take: No. 10 North Central at No. 13 Illinois Wesleyan. IWU clinches the CCIW Pool A with a win, while the loser gets a potential Pool C-crushing second loss. Doesn’t get much better in Week 10. Keith’s take: No. 4 UW-Whitewater. UW-Stevens Point beat Oshkosh last week, but this only happens if Warhawks relax after clinching a playoff spot. Ryan’s take: No. 14 Trine. I think the Thunder have floated high up the poll, and with the way the MIAA has been this year, another shakeup would fit right in. Pat’s take: No. 18 Salisbury. Wesley has had Salisbury’s number in recent years, so hopefully they lead by enough that a missed PAT won’t matter. Adam’s take: No. 18 Salisbury. Wesley may take its frustration of missing the playoffs for the first time since 2004 out on the Sea Gulls. Frank’s take: No. 14 Trine. Yo, Adrian. Your inconsistent season has shown you know how to score plenty. Trine seems fatigued, and here’s your chance to knock them out. Sean’s take: No. 18 Salisbury. In 13 years calling Wesley games, they are 11-1 against their Route 13 rivals. Curious to see if Wesley’s scheme changes against the triple-option after the death of head coach/defensive coordinator Mike Drass. Which non-purple team clinches an automatic bid this weekend? Keith’s take: The Yellow Jackets from Randolph-Macon, although The Game is more fun with something to play for. Ryan’s take: Eureka. The Red Devils haven’t gotten much national love yet, so I’m sure they’re itching to show their stuff in the postseason. Pat’s take: Brockport. No purple in them Golden Eagles. Adam’s take: Randolph-Macon. The streaking Yellow Jackets just need to get past Ferrum to make this season one of the least wacky in recent ODAC memory. Frank’s take: Husson. Gallaudet’s SOS is less than .200. The thought that they could beat the Eagles is highly unlikely in the ECFC. Sean’s take: Claremont-Mudd-Scripps.No violet, lavender, mauve, or lilac to be found in the shadow of Mount Baldy. The Cardinal and Gold-clad Stags win the SCIAC for the first time since 1987. Keith’s take: Amherst and Trinity (Conn.). Because I’m endlessly fascinated by projecting how the NESCAC’s best would fare if it chose to participate in the playoffs. Ryan’s take: Wash. U. at Millikin. Neither are going to the playoffs, but the Bears continue to show why they belong in the CCIW. Pat’s take: Middlebury at Hamilton. The Rocking Chair has been won by Middlebury more times than I care to count, but some inconsistent results just have me wondering if the Continentals might take it home. Adam’s take: Defiance at Earlham. I probably won’t be the only one. But if the Quakers can’t defeat winless Defiance this week, I don’t know when the record-breaking losing streak will end. Frank’s take: Potentially up to 16 of them in nine East Region conferences and Pool B in our “In the Huddle” D3BlitzER whiparound show, noon to 4 p.m. ET on the D3Huddle Facebook channel. 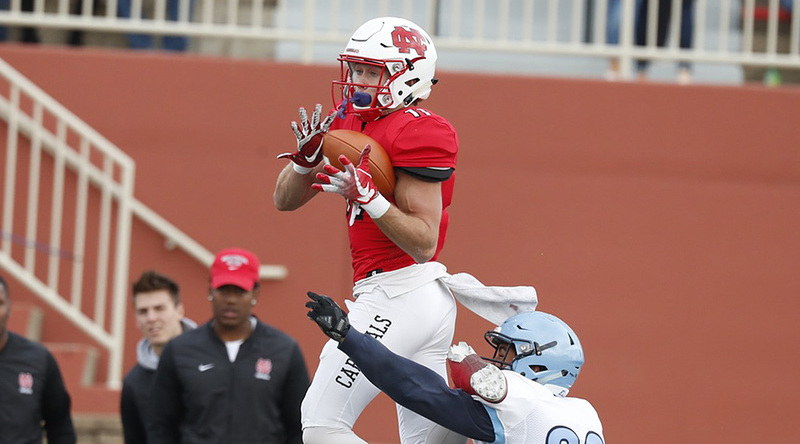 Sean’s take: Rowan at Montclair State. The 6-2 Red Hawks could still play into the East Regional Rankings which would benefit Frostburg or Salisbury for seeding or a Pool C bid. Who will still be tied for first in the ARC after this week’s games? Keith’s take: Simpson and Wartburg. Ryan’s take: Wartburg and Dubuque. Simpson has been hanging on too closely in games this season to remain with the leaders. Pat’s take: Simpson and Wartburg. Wartburg won’t have much trouble with archrival Luther and Simpson has surprised all season, so now we should expect the win. Adam’s take: Dubuque and Wartburg. The Knights take care of Luther with ease at home, while the Spartans get past Simpson on the road. That sets up a winner-take-all showdown in Week 11. Frank’s take: Wartburg and Simpson. Simpson has played somewhat better defense than Dubuque this season. And Wartburg is playing a much lesser opponent. Sean’s take: Wartburg and Dubuque. Wartburg should conquer the Norse, but Dubuque won’t need to rely on a Simpson missed PAT this year to stay on top (painful topic for Wesley fans). Who goes into a rivalry game on a down note? Keith’s take: Hard for me not to say Cortland here, although the Red Dragons can surprise us all. Ryan’s take: Gettysburg. The Bullets have a very tough Muhlenberg team before taking the field against century-long rival F&M for the Lincoln Trophy. Pat’s take: Cortland. A super down note that’s probably included minus-40 yards rushing. Adam’s take: Hanover. The Panthers could play rival Franklin for the Victory Bell and the HCAC title in Week 11. But first, they have to get past a hot Rose-Hulman team. The Fightin’ Engineers have more recent big-game experience. Frank’s take: Amherst. Trinity has steadily regained traction after a stunning loss to Williams. The Bantams nip the Mammoths before The Biggest Little Game in America next week vs. the Ephs. Sean’s take: Carnegie Mellon. While they’re studying to cram Case Western Reserve’s Pool C dreams in the Academic Bowl, Westminster could pin a fourth demerit on the Tartans’ report card. This is where we get to crunch time. 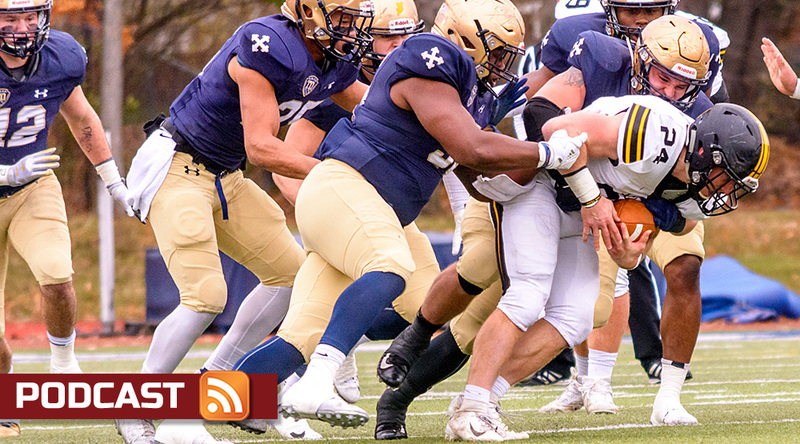 We could hand out as many as 15 of the 23 remaining automatic bids to the NCAA Division III playoffs on Saturday, and so you can follow along, we go through each of the remaining conferences, rather exhaustively, to tell you who can clinch on Saturday, what they need to do, and who might be waiting until Week 11. All 122 games on Saturday will take place in an 11-hour period, meaning results are going to be coming in fast and furious. Before the games start, set aside some time to get Pat and Keith’s take on what will happen in Week 10. 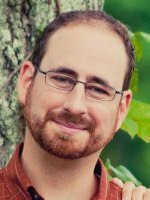 Plus, Adam Turer joins in to talk about his story about Wabash in Thursday’s ATN column and what he takes away from the experience. And our guest is Hanover coach Matt Theobald, who is hoping his team can pull off two big wins and garner itself a share of the HCAC title.